Situated on 10 secluded tropical acres fronting one of Maui's most beautiful white-sand snorkeling bays, this resort appeals to travelers of all ages and is ideal for families. Experience the Aloha Spirit at this Plantation-style resort. Studios and suites are spacious and comfortable with fully equipped kitchenettes. Enjoy the complimentary weekly Mai Tai party, an 18-hole putting green, in-room Internet access and parking. 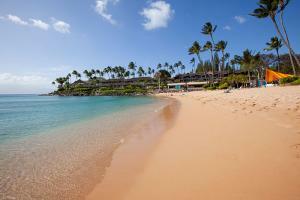 The Napili Kai Beach Resort is located north of the Kaanapali resort area and south of Kapalua, on a beautiful beach. It is approximately 50 minutes from Kahului, and about 5 minutes from the West Maui airport. Whale Watchers Bar, Beach Pagoda. Bike down Haleakala volcano, Helicopter Tours, Hana Adventures, Sailing Trips, Luau, Hike Maui, Golf, Snorkeling, Scuba.